In the coal mines of turn of the century Russia, a group of unsuspecting workers suddenly and completely without warning they all turn aggressive, violent, and paranoid. Shortly following the strange and savage incident, a scientist and Grigory Rasputin blow up the mine to conceal all evidence of the incident. In modern day New York City a Russian diplomat seems to have jumped to his death. Though it appears to be a suicide, there are some tell tale signs that he was more likely pushed from the window. The owners of the apartment Leo Sokolov, a retired physics teacher from Russia and his wife, are also missing. FBI agent Sean Reilly is sent to investigate and locate the missing husband and wife. It becomes pretty clear that Leo Sokolov has been living a double life. As the novel unfolds we discover that Sokolov has ties to what happened in 1916 at the coal mines and we soon learn more about his life and how be became a teacher hiding out in the US. Meanwhile, Reilly ends up with two dead detectives on his hands at a hotel along with two other dead bodies all shot execution style before they could pull their weapons. After searching the hotel room, they find the name “Sledgehammer” written in Russian on the wall. The Sledgehammer is a known Russian gangster and there is evidence that this gangster was holding Sokolov’s wife in the hotel room. So do all these things have in common? Reilly must figure it all out and find Sokolov before the Seldgehammer, or someone else, find him. Sokolov is the key to unlocking the mystery! The book alternates between the past and present, In the historic parts of the book we gain insight into the mind of Grigory Rasputin and of course his rise to power. Misha, Sokolov’s grandfather, and Rasputin worked together to develop a device that could influence peoples thoughts and actions in different ways. As the novel progresses the past and the present story lines intertwine and come together in unexpected ways. What I liked about the novel and the writing style was it was gritty and edgy without being crude and inappropriate. There wasn’t an over use of cursing or too much blood and guts, there was a tasteful use of these devices but not so much that it would put readers off. This wasn’t really a spy novel, though there were spies and spooks in the novel, it was more of a historic thriller. I liked how both of the stories merged together in the novel. There were a lot of suspenseful moments and plot twists to keep me interested. It was full of action from the first chapter which I also liked. I liked Reilly’s character, he wasn’t perfect and I liked that he was a bit unpredictable. The only thing I didn’t like was I didn’t feel like I knew enough about him and his back story. There was a side story about his son and some brainwashing that occurred and Reilly is out for revenge on the responsible parties. I felt a little lost with that plot line. I wasn’t sure if this plot was picking up where another book finished or if it was new to this book. Either way I just didn’t feel like I knew enough about what was going on and I would have liked to have seen that plot more clearly. The idea for the story was intriguing and different, not your run of the mill thriller or spy novel. 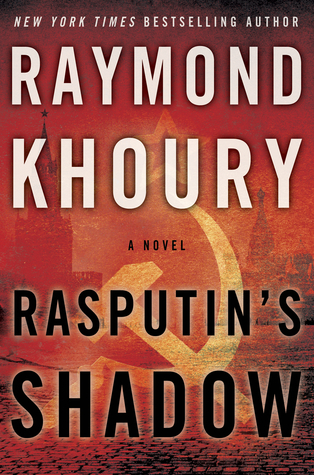 Khoury does his research on both the modern US intelligence and Russian mafia as well as the historic figure Rasputin and Imperial Russia time very very well. He’s was very through and presented both time periods in an understandable and exciting fashion. I did struggle a bit with the explanation of “the machine’ and how it worked. It was a little dense and tedious for my taste. Though it’s complicated, I think most readers will be able to follow along with the general concept alright though I would have liked it to be more straight forward. I really enjoyed reading about this period in history. I’ve said it before and I’m saying it again…this is the year of Russian literature for me. I didn’t necessarily plan it that way but it’s been really exciting to read a lot of Russian based literature. I don’t know very much about Imperial Russia, communist Russia, or the KGB/Russian mafia but I have really learned a lot from the many books I’ve read this year. After reading this novel in-particular, I really want to read more about Imperial Russia and the Romanov empire etc. Over all, a nailing biting historic thriller!